Eleven Brilliant Round Cut Vibrant Diamonds dazzle in an elegant channel setting held in luxurious highly polished 18 Karat yellow gold band. This 0.50 Carat t.w. 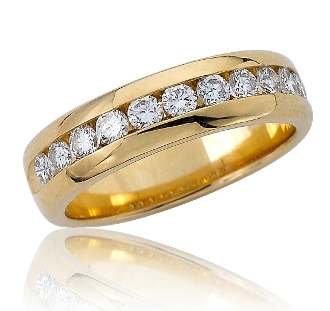 ring is ideal for your wedding vows, or an anniversary gift. Weighing in at 5.5 grams, this masterpiece is sure to bring years of joy and pleasure. For added appeal personalize your item, select our Engrave option and indicate size needed when adding to Cart.